A recent report by Oxfam International highlights the dramatic rise in income inequality by noting that the combined wealth of the world’s top 8 individual billionaires is more than the lower half of the world’s population, some 3.6 billion people. The intention of the report was to bring awareness to the unfairness and injustice inherent in our global economic system. 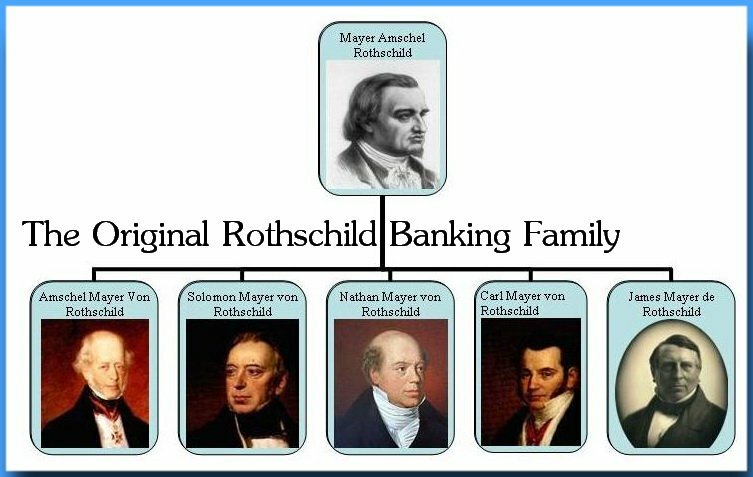 Fast forward to 2016, the Rothschild family is a dynasty of unimaginable wealth which manages to somehow conceal it for the most part, never quite being publicly credited as the richest and most influential family in the world. By dividing their capital and holdings up amongst the many members of the family, including numerous descendants and heirs, occasionally a single member of the family will appear on a list of the world’s top individuals; however, the family as a whole represents the largest fortune ever known. LD: See my note below in which the idea that the Rothschilds own a mere $2 trillion (in total wealth between various family members) is dismissed as a nonsensical underestimate. The actual figure provided elsewhere is a staggering 250 times that amount, i.e., $500 trillion, amounting to half the total wealth of the world. 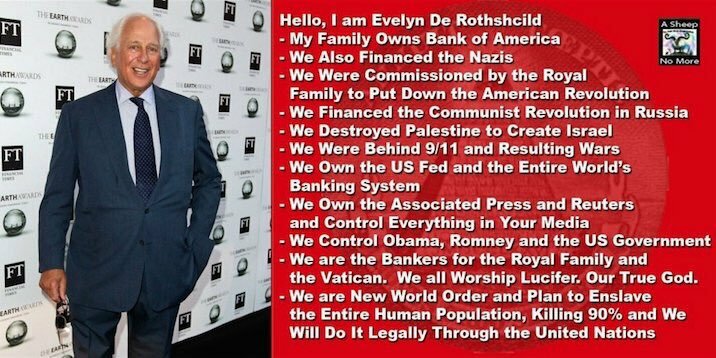 The bizarre statement that the Rothschilds own as much as the rest of the world’s 7.5 billion people put together could be untrue; they probably own more. (2) Among the eight billionaires mentioned in the list above, the last three are American Jews with a combined wealth of 128.2 billion dollars. So an enormous amount of American wealth is concentrated in Jewish hands. With $128 billion in their hands, the three American Jews mentioned above can buy up all the bitcoin in the world (or the Solomon Islands) and still have $127 billion left. Or they could buy up 128,000 million-dollar houses. Amazing! And how long would it take each of them to pay a flying one-day visit to inspect all their combined properties? It would take them 345 years each! (4) Jews make up only 2% of America’s population; but according to a recent Forbes Israel list, they make up a whopping 24% of American billionaires. Out of 442 US billionaires, 105 were Jews. (Source). With such enormous wealth concentrated in the hands of American Jews, is it any wonder they own the mass media and major corporations as well as have huge reserves left for the bribery and corruption of American politicians? To summarize. I wrote this a few years ago in an article on 9/11. It still holds good. Forbes magazine, which supplies us regularly with lists of the richest people in the world, makes a point of excluding the very richest: those whose wealth is either beyond computation or public scrutiny. These include the Queen of the Netherlands (the world’s richest woman), the Queen of England, the Queen of Denmark, the Queen of Spain, the Sultan of Brunei, King Fahd of Saudi Arabia, and the kings of Kuwait, Oman, Qatar and Bahrain. Staggering amounts of gold bullion, diamonds, jewelry, rare art, antiquarian books, coins, precious metals and stones clog up their underground vaults. These people have never set eyes on most of the things they possess. They have never set foot on the land they own. In spite of all their fantastic wealth, it seems they still feel desperately poor and insecure; nor can they rest easy in their beds until they own everything and the rest of mankind is reduced to a condition of abject slavery. 9/11 was a catalyzing event for these emperors of opulence. It ushered in a new world order and precipitated a series of catastrophic new wars that would help to create new starving refugees, new impoverished immigrants, and new opportunities for endless exploitation by a predatory Jewish elite.